So in the previous post I highlighted a new dynamic RSS fed Windows 7 theme that featured photos from my wife’s garden. I want to share with you in this second post just how you can create your own dynamic theme with just a few extra steps in front of the typical built in sharing that Windows 7 offers through Theme Packs. First you need a theme file and for this we are just going to utilize one of the files that are already included in Windows 7. No reason to retype all the information to add just a few lines at the bottom. We are going to use that highlighted file which is the default Windows 7 Aero Theme. Just Right Click on that file and choose Copy. You can now close Windows Explorer and head back to your desktop. Find a blank space on your desktop and Right Click once again and this time choose Paste. This should place a copy of the aero.theme file on your desktop. 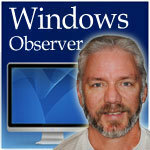 Windows Observer RSS themes, Windows Observer. permalink. Maketecheasier.com: How to make Windows 7 System Startup & Shutdown on a schedule.